Nuraini Adamu, son of former Governor of Nasarawa State, Abdullahi Adamu, and one Felix Onyeabo Ojiako were both arraigned by the economic and financial crimes commission, EFCC, on Wednesday, February 14, 2018, before Justice Farouq Lawal of the Kano State High Court on a four-count charge of conspiracy, forgery and obtaining money by false pretence. Adamu and Ojiako’ arraignment followed a petition by one Atta Esin alleging that the defendants conspired and used his company name, Biolocks Technologies Limited, to execute a contract without his knowledge. He further alleged that the contract resulted in the accumulation of withholding tax to the tune of N1,311,519.99. The contract according to the petitioner was worth N26,230,399.60, but investigation into the alleged fraud revealed that the actual contract sum was N92,036,490. The defendants, after entering a plea of ‘not guilty’ to the charge preferred against them, were granted bail in the sum of N2 million each and one surety in like sum. The surety must be a public servant of grade level 12 or any resident of Kano with landed property within the jurisdiction of the court. The surety must also swear an affidavit of means in respect of the landed property and, must deposit his passport with court registrar. In the meantime, the court ordered that the defendants be remanded in EFCC custody pending the fulfillment of their bail conditions. The case has been adjourned to April 16 for the commencement of trial. 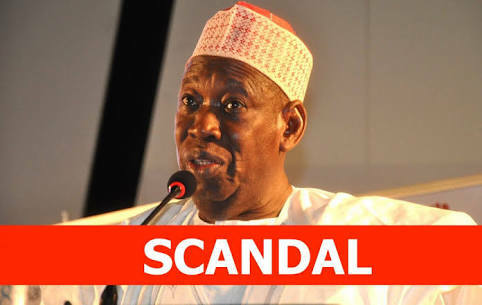 It would be recalled that Adamu and Ojiako are currently facing trial on another five-count count charge of money laundering before Justice J. K. Daggard of the Federal High Court, Kano. The post Son Of Former Governor Arraigned Over N92 Million Fraud appeared first on The Trent.